The 70 kilodalton heat shock proteins (Hsp70s or DnaK) are a family of conserved ubiquitously expressed heat shock proteins. Proteins with similar structure exist in virtually all living organisms. The Hsp70s are an important part of the cell's machinery for protein folding, and help to protect cells from stress. The Hsp70 system interacts with extended peptide segments of proteins as well as partially folded proteins to prevent aggregation, remodel folding pathways, and regulate activity. When not interacting with a substrate peptide, Hsp70 is usually in an ATP bound state. Hsp70 by itself is characterized by a very weak ATPase activity, such that spontaneous hydrolysis will not occur for many minutes.By binding tightly to partially synthesized peptide sequences (incomplete proteins), Hsp70 prevents them from aggregating and being rendered nonfunctional. Hsp70 also aids in transmembrane transport of proteins, by stabilizing them in a partially folded state. It is also known to be phosphorylated which regulates several of its functions. Hsp70 proteins can act to protect cells from thermal or oxidative stress. These stresses normally act to damage proteins, causing partial unfolding and possible aggregation. HSP70 Polyclonal Antibody was affinity-purified from rabbit antiserum by affinity-chromatography using epitope-specific immunogen. This antibody has been tested with WB, IHC-p and ELISA. And Abbkine suggested starting dilutions are as follows:WB: 1:500-1:2000, IHC-p: 1:100-1:300, ELISA: 1:20000. Hsp70 is overexpressed in malignant melanoma and underexpressed in renal cell cancer.Both HSP70 and HSP47 were shown to be expressed in dermis and epidermis following laser irradiation, and the spatial and temporal changes in HSP expression patterns define the laser-induced thermal damage zone and the process of healing in tissues. I trust Abbkine very much. 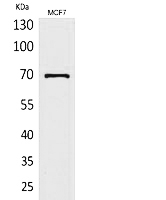 HSP70 Polyclonal Antibody is one of the top products that I think.